Earlier this year the Historical Harp Society of Ireland acquired an interesting harp, made by James McFall in Belfast. I don’t know the exact date of manufacture, but it must be between about 1900 and 1950. We know that McFall adverised the availability of harps withe wire strings as well as the more usual gut-strung revival instruments. The harp has 22 strings, and as found it retained many old strings, showing a scheme with four wound basses and the rest of plain iron wire. 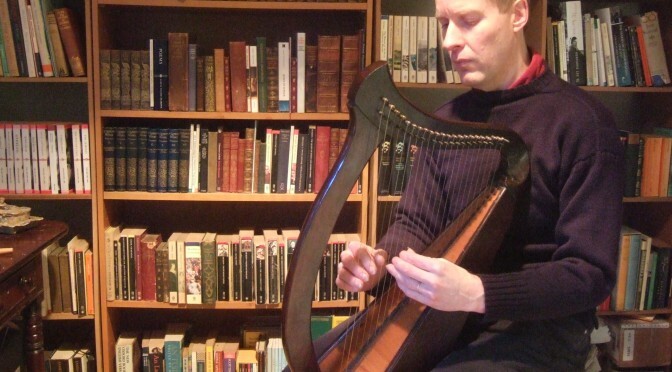 The shape of the harp is similar to other smaller McFall harps I have seen, except that unlike all his others, this one has a square back instead of his usual rounded back. It seems likely to me that the square back combined with the extant iron strings are fair hints that this was designed as a wire-strung harp. I measured all of the remaining strings carefully before removing them, and individually bagging and labelling them to be kept with the harp as its ‘archive’, before fitting new strings. I tried to match the old strings, using Malcolm Rose’s soft iron of similar gauges. Because the harp has a very thin, braced, crossgrain soundboard, it has a very boxy, tinny, twangy sound, very different from a good replica early Irish harp as we aee used to today. But I think it is very interesting to think about how an instrument like this might have been used as part of the early 20th century revival of the early Irish harp. I have chosen a traditional Irish midwinter song air, from Bunting’s 1809 volume, for this video. Next Next post: Kelt and Keltic, or Selt and Seltic?